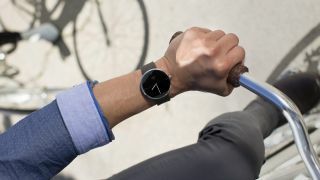 "Let's hold a meeting while I ride to this meeting"
If you're of the opinion that smartwatches don't have any practical use in the workplace, this nifty development in wearables just may change your mind. Virtualization company Citrix has modified its GoToMeeting app to run on Google's Android Wear smartwatch OS, allowing you to present while you preen, market while you move, and up-sell while you, er, undress. Oh - and you can join and host conference calls and meetings too. According to the app's page on the Google Play Store, that's only scratching the surface of what it can do. In addition to attending GoToMeeting sessions, Citrix says that the app can generate alerts for upcoming meetings, view presentations, mockups and reports, conduct VoIP calls, view attendee webcams and more. While that sounds impressive, don't forget that you'll need your Android 4.0 (or higher) smartphone on your person to use the Android Wear app, and we'll reserve judgement of how handy those features are while running on a tiny smartwatch screen until we've seen it in action.